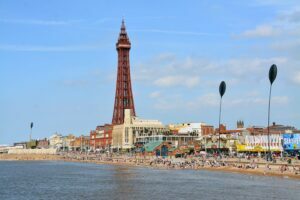 Here at Live Blackpool we’re sure that there are plenty of local descriptions of exactly which place is which. 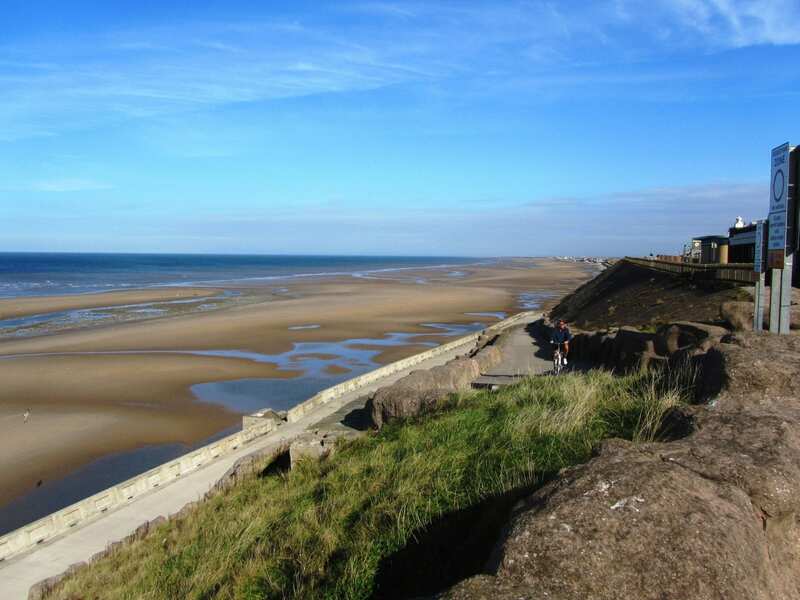 But for the purposes of this page we’ll say Blackpool North Shore covers the area from Bispham to North Pier.  It’s about right, and is just one page in our thorough guide to the huge seafront at Blackpool! Apologies in advance that photos are taken facing both northwards and southwards. Because of the direction of travel of the sun it is often better to take photos facing northwards so that the sun is on the subject rather than the camera lens! Are you sitting comfortably? 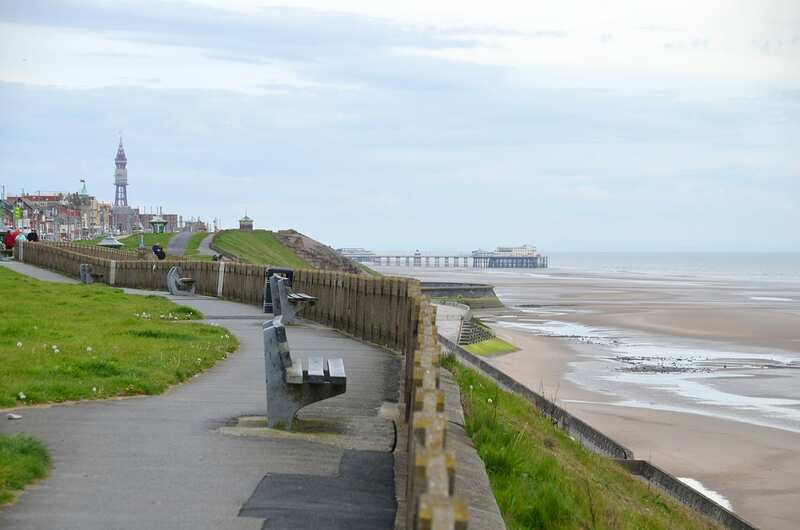 Just to confuse you we start with two videos which are actually North Pier to Bispham with the sea on your left! The first clip travels along the promenade from North Pier to Gynn roundabout – that’s the one which always has an Illuminations feature on it. The second clip travels further north along the prom from Gynn roundabout to Red Bank Road, which is where the Illuminations end at Bispham. So, to go back to the title of the page – North Shore: Bispham to North Pier – Bispham is where we’ll begin. 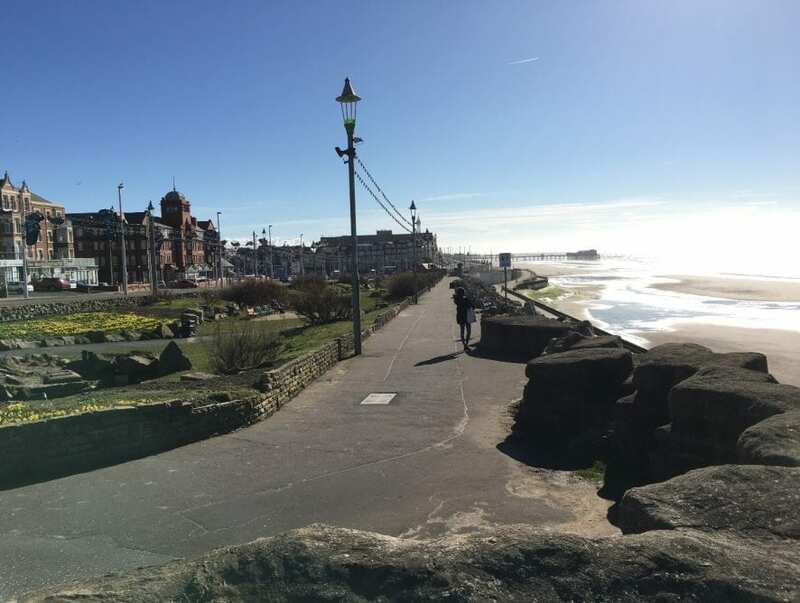 It’s quite identifiable even if you don’t know the area – it’s where the tableaus start/end on the cliff and where the illuminations begin to welcome visitors to Blackpool. When travelling in a car here, even though the promenade hugs the coast you can’t actually see much of the beach from the main road. On foot the views are spectacular from the edge! The footpath along the grassy banking adjacent to Queens Promenade, the main road (above), is one of only a few high areas of land on the Fylde Coast. From here you can see across the Irish Sea to neighbouring Cleveleys on your right and the Lake District beyond. On a clear day looking to your left you can see North Wales. On a clear evening you can see the Isle of Man. It’s straight out to sea, beyond the windfarms. With the sea on your right you’re heading south towards the bright lights of Blackpool. Why don’t you leave your car behind and enjoy the view! 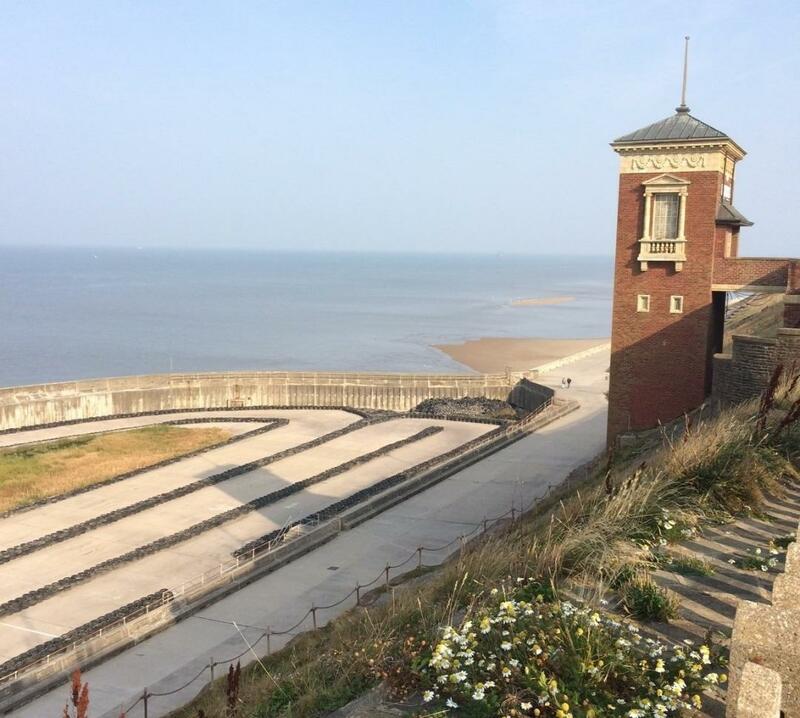 On foot, you’ve got a choice of three levels, each one is an important part of the sea defence in its own right. Choose from the very top of the banking against the highway and tram tracks as they make their way along the seafront. Next is the middle walkway, then the lower promenade from where the next stop is the beach. 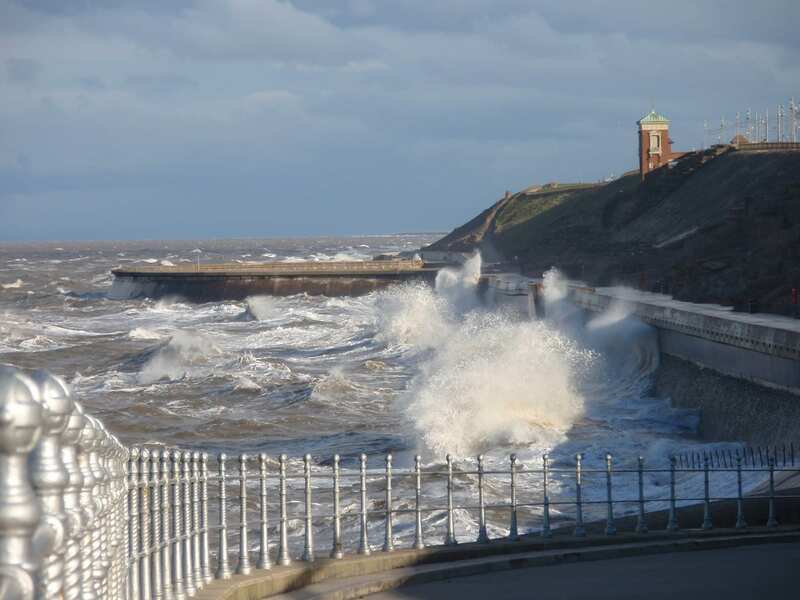 Please use your common sense when walking along this section of seafront in bad weather, and don’t go down to the lower levels during storms. All along this stretch you’ll see wildflowers growing among the steep grass bank. In spring the pink flowers of thrift nod in the breeze. 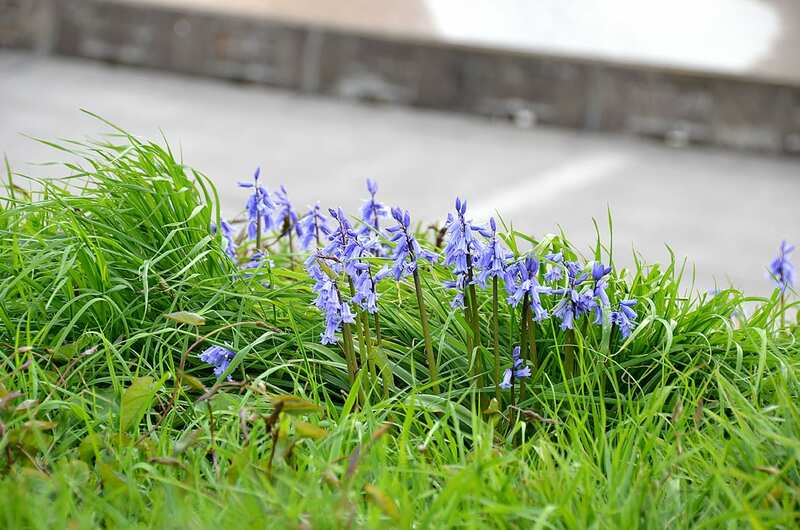 Bluebells grow wild all along this coastline and then in early summer there are the white bells of sea campion. Between Red Bank Road at Bispham and Jubilee Gardens near Gynn Roundabout is where you’ll find the huge Blackpool Illuminations tableaux during the late summer and autumn season. Every summer the huge grey poles are erected which support the illuminated scenes of all types. There are children’s nursery rhymes, figures from TV and dinosaurs from the past, all brought to life each year with millions of LED lamps (because bulbs grow underground! 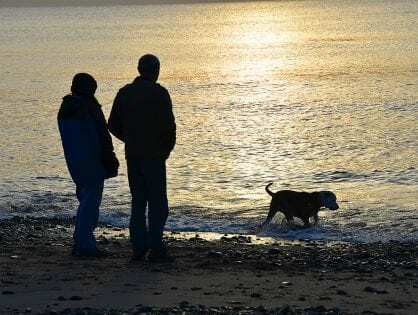 🙂 ) If you haven’t walked the route with your family you really must come along – safe from traffic and packed with people it’s a great atmosphere and a great evening out. Check out our Blackpool Illuminations website here, for lots of photos and information about the Lights. Carry on walking south and you come to the area known as The Cliffs. What was once a boating pool jutting out into the sea is now laid out as a site for karting (below). The Cliff Lift itself is no longer in use, but it makes a good landmark. If you’re into wave watching then the top footpath is your best spot on a windy day at high tide. 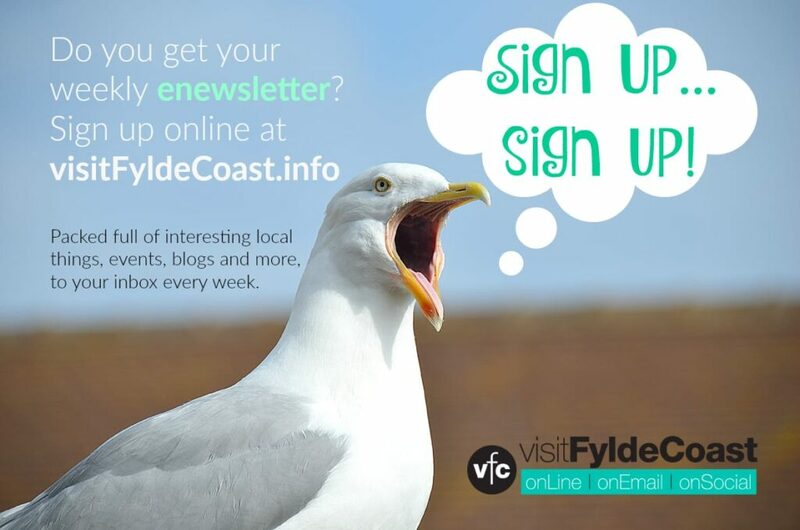 All through the year you can see spectacular displays of the weather along the Fylde Coast and at Blackpool, with the best views of waves and spray lifting high into the air from this point. Please note: You shouldn’t go down to the middle and lower walkways during storms. Always follow beach safety guidelines. Always respect the water. 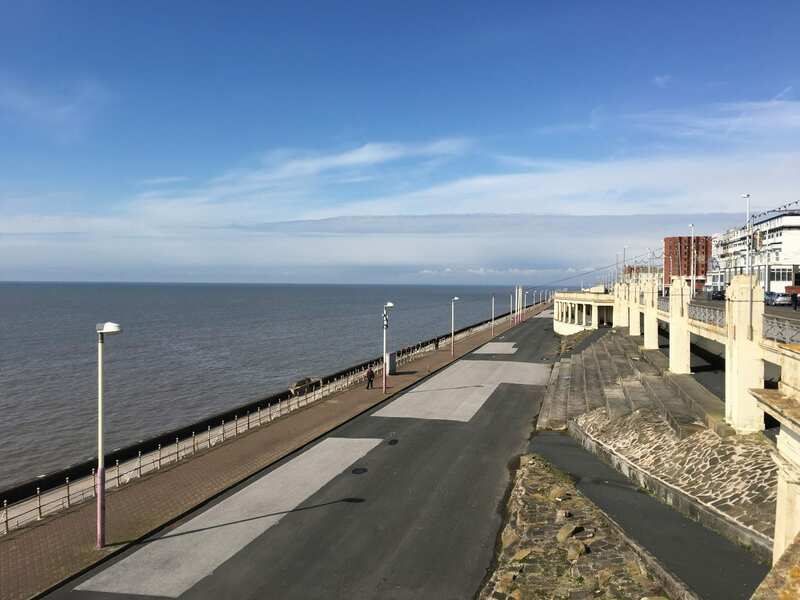 After the Cliff Lift as you approach Gynn roundabout, you’ll come to the spacious seafront Jubilee Gardens between the edge of the promenade and the tramway. It’s a sunken garden built over 100 years ago by our Victorian ancestors, which has recently been adopted by the relatively new Friends of Jubilee Gardens Group. In a short space of time they’ve already transformed it. 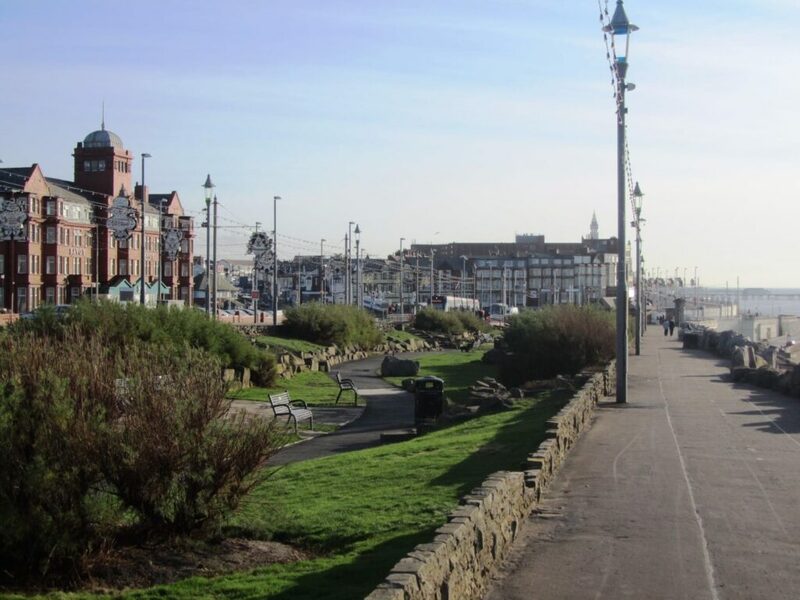 Gynn Roundabout is another good local landmark – it joins the main promenade routes with roads that head inland to Bispham past the Rock Gardens. 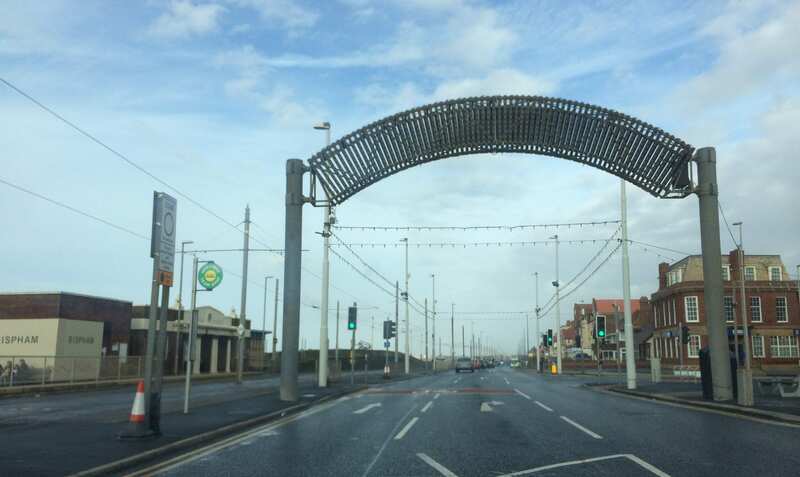 Here on the roundabout itself you’ll see a varying assortment of displays from the Blackpool Illuminations. 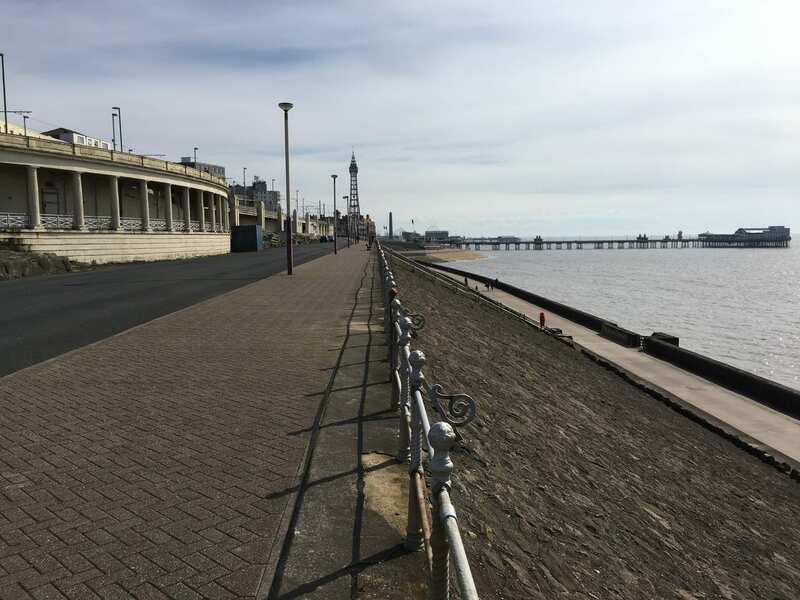 Our journey continues southwards towards North Pier, and on the lower walkway in the area across from the Imperial/Hilton Hotels you’ll find the Colonnades. In this short clip below we’re stood on the walkway in front of the Colonnades, as a tram passes above. 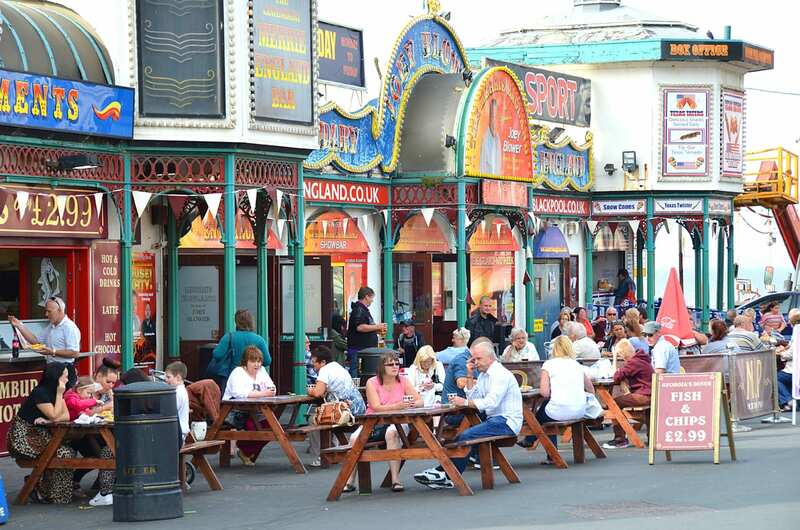 They’re an attractive and original feature which date back to 1925 and hark back to the long history of Blackpool as one of the original British seaside resorts. Access the lower walkway from the main promenade with the footpath (above) to find the five curved bays which cover nearly a kilometre. They replaced the earlier coastal defences which had been built as grassed slopes in 1895-99. Our journey southwards continues, and now you start to feel like you are arriving in Blackpool! The promenade continues here at split level with the lower walks taking you past the Princess Parade Colonnade of 1912. 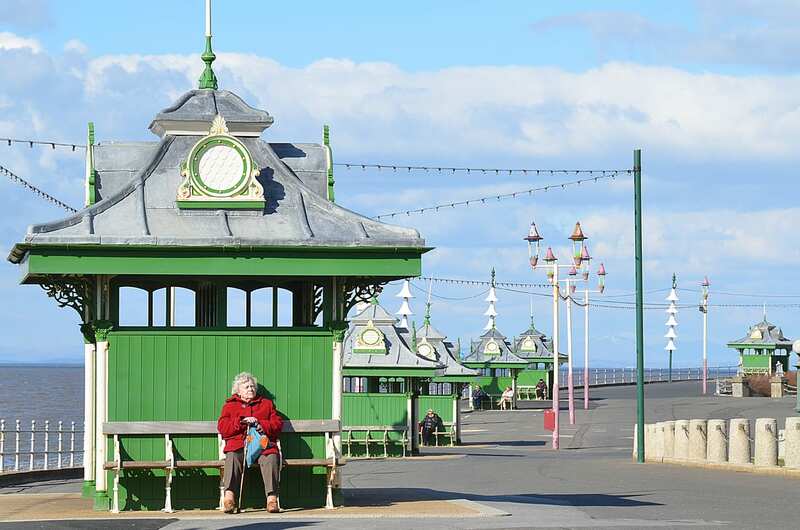 With Victorian shelters and benches and a spectacular view, the Promenade at Blackpool is one of the greatest spots from which to enjoy the evening sunshine as it sets on the west coast, and on a sunny day there’s nowhere better to be. 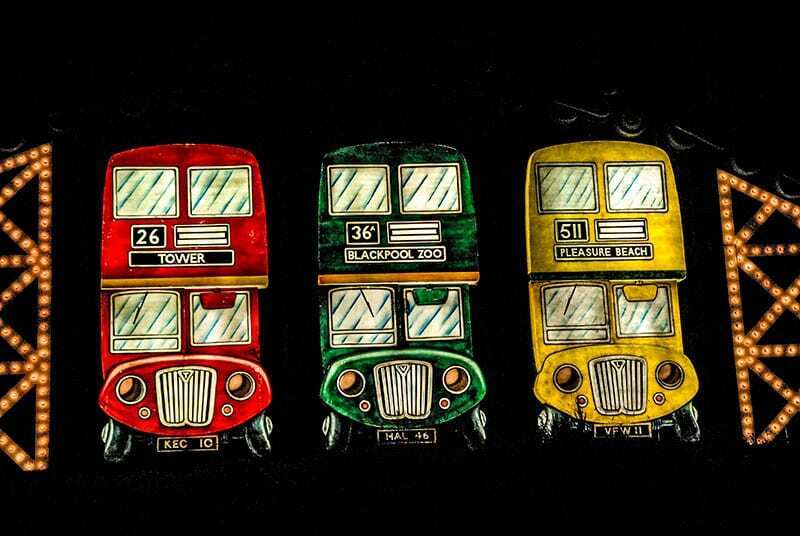 You can catch one of the new Blackpool trams at one of the stops anywhere along the seafront. Or if you prefer you can travel in style on a Heritage Tram – they have their own special Heritage Tram Stops. Head north to Cleveleys and beyond it to Fleetwood, or travel south to the bright lights of Blackpool. 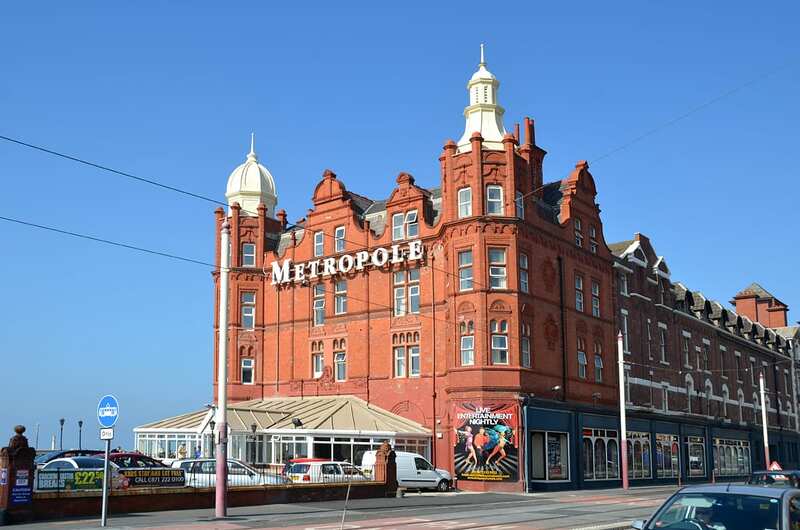 The Metropole Hotel (above) is the only holiday accommodation on the seaward side of the highway, along the whole of the Fylde Coast. 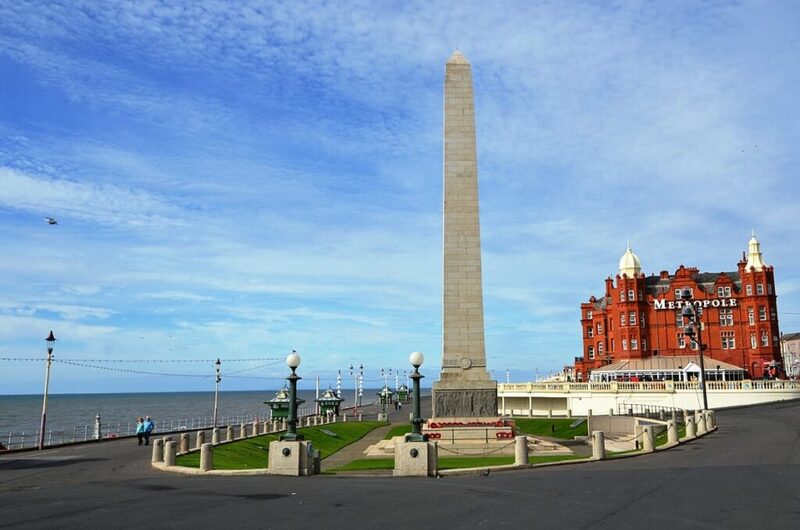 There are attractive gardens here too, and the Cenotaph between the hotel and pier. Finally you have arrived at North Pier and this page is complete. 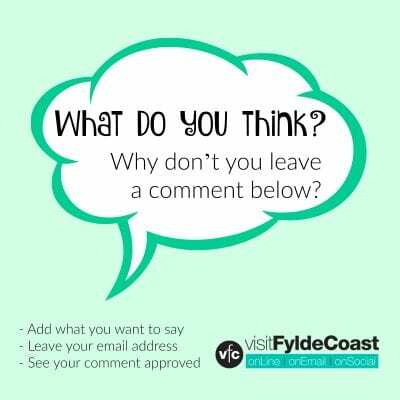 If you’ve enjoyed this page, why not carry on travelling south along Blackpool Central Promenade.